Forums » General Discussion » The Water Cooler » Canadians, they're everywhere! #383655 - 10/04/12 09:13 AM Canadians, they're everywhere! So, I'm no longer in my 30's as of about 6 weeks ago, so I am no youngster, but I do play online games with some buddies of mine while my wife watches things like Dancing With the Stars and Cupcake Wars. Anyway, we were playing last night and are part of a clan. A clan, for non-gamers, is just a group of people together under a common banner (the clan name) playing together - AKA, we are on the same "team" in games. Last night, we were working on some Minecraft stuff - dominating a PvP (Player vs. Player) server, and building awesome things in another - and more and more of the clan was getting online using a voice chat program called TeamSpeak. We were all chatting away before someone asked, "Where are you from?" Of the 8 people playing Minecraft, it was a 50/50 split. Four people from the U.S. (interestingly, all from Iowa), and four people from Canada. We started talking about this and found out that the clan run servers are hosted in Chicago (USA) but there are about 75% of the clan members are from all over Canada. It is still called Canadian Bacon, even in Canada, and Canadians are proud to have their own kind of bacon even if it is really just ham. I guess that would be similar to Kentucky Fried Chicken. In Kentucky, they don't just call Coln. Sanders' place "Fried Chicken." It is still "Kentucky Fried Chicken" in Kentucky. Which makes me wonder if it shouldn't be whatever the local state name is, plus "Fried Chicken" for each restaurant. They could all have one menu item that was more indicative of their state. So "Iowa Fried Chicken" could be like a piece of chicken wrapped in ham or bacon for the pork. "Nebraska Fried Chicken" could have some sort of beef/chicken combo. I'm just not sure about Alaska's "Frozen Fried Chicken Platter," or "New York Fried Chicken's" specialty item. They would never decide on a single cultural food item, so that menu slot would be blank. When you ask about it, they would just respond "forget-dabout-it." These are the conversations had whenever talking to Canadians and the idea of bacon comes up. What you refer to is the crap you get in the united states that is pawned off as Canadian Bacon but it isn't. The only thing Canadian bacon and ham have in common is it comes from a pig. Commonly called back bacon here. I heard the term Canadian bacon for the first time in the US. I always refer to it as Peameal Bacon. Never, ever Canadian Bacon. If you don't call it Canadian Bacon, then how can you argue that Canadian Bacon isn't just ham? Wow. The Canadians do love their CanBac (that is what I call it, you can't steal it). I didn't realize that it was THAT much different. I know it isn't ham, even here in the U.S., but the cuts we get are like real lean ham. They aren't smoked, or at least don't taste like it. It is definately different flavor, but still very "ham like" here. So does it look sort of like this with the crust? EDIT #2: Holy crap! That site wants $74.95 USD (plus shipping I am sure) for a 5 pound roast of the stuff. Ouch! If my travels ever take me up to Canada, I know that I will have to try some of this stuff though. What is referred to as "true" Canadian Bacon (this term mainly comes from people outside of Canada) is Peameal bacon. Very tough to get in the US. That's why the Yankees refer to it as "Canadian Bacon". 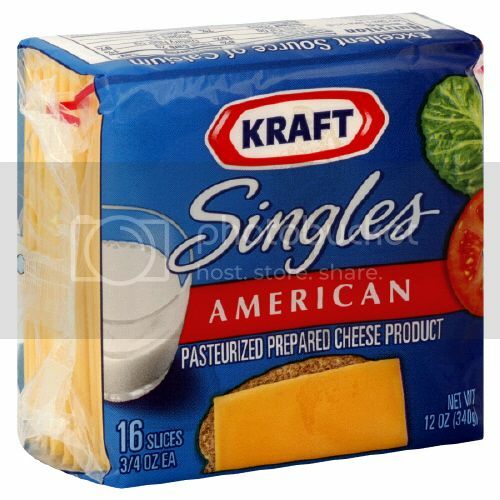 It's like how Americans refer to a slice of Kraft Singles as "American Cheese". Talking to my local butcher about 3 weeks ago, he had a guy come in from North Carolina and put in an order for 100lbs to take back with him. Great peameal bacon has a real clean flavour to it. It's hard to describe. 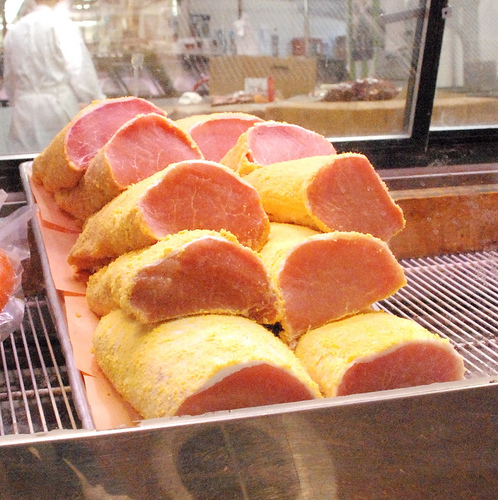 Peameal bacon comes from the loin, the taste, colour and texture (from the curing) is much different than just the standard loin you can get in the store. My favorite way is to BBQ the entire slab first, letting it rest for 15 minutes, then slicing it into very, very thin slices for sandwiches. That is the real deal right there! It's like how Americans refer to a slice of Kraft Singles as "American Cheese". Well, in all fairness, that might be because Kraft refers to it that way. Thought that looked like pork loins.